Dr. Ruth MacPete gives you the low-down on fleas. For more from Dr. MacPete, find her on Facebook or at www.drruthpetvet.com! If you’re like me, you’ve been anxiously waiting for the warmer weather and longer days. However, we aren’t the only ones looking forward to the warmer weather. Our pesty little friend the flea seems to re-emerge during the hot summer months. Although fleas can be a year-round problem depending on where you live or whether they have settled inside your home, summer marks the peak of flea season. They are extremely hardy animals that have been around for more than 100 million years. They have an exoskeleton that withstands high pressures and is shock resistant. You can drop a flea from five feet and not kill it because of their exoskeleton. Fleas are incredible athletes. A flea can jump over seven inches high and thirteen inches long. If a flea were the size of a human, that’s equivalent to jumping 1000 feet high! Why care about these little bugs? Fleas can transmit tapeworms when your pet ingests them. Tapeworms are intestinal parasites that can cause malnutrition if untreated. Fleas can also transmit Yersina pestis, the bacteria that causes the bubonic plague. Young animals with severe flea infestations are at risk for developing anemia. Not only do fleas annoy their hosts relentlessly, some animals are sensitive to fleas and can develop a skin reaction called “flea dermatitis," which can then lead to bacterial skin infections (pyoderma). Don’t forget, fleas can also bite people! Fleas cause many pets to become itchy. If your pet is scratching or biting their legs, rump, or feet, they could have fleas. Likewise, if you notice black specks that look like pepper on your pet’s skin, this could be flea dirt. Flea dirt is actually flea poop or digested blood. You can tell if the specks are flea dirt by wetting a Q-tip and then touching the black flecks. It’s flea dirt if the Q-tip turns red or rust color. Not all animals scratch or chew when they have fleas. To check for fleas, look for them on the skin near your pet’s rump, tail and belly. 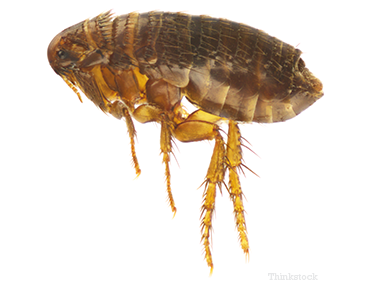 Since adult fleas are fast and not easy to spot, be sure to also look for flea dirt. If your pets have flea dirt, they have fleas, even if you never see a flea. You can also use a flea comb, which has very fine teeth, to look for fleas and flea dirt. Use a wet paper towel to wipe off the comb and look for fleas and flea dirt. Use one of the many safe and effective flea products. Your veterinarian will help you pick the best choice for your pet. Be sure the products you use target more than one stage of the flea’s life cycle. Use these products year-round to keep your household a flea-free zone. Always follow the product’s instructions. Some products can be toxic and even fatal if used incorrectly. Never use a product meant for dogs on cats. Some dog products contain ingredients that can be toxic and even fatal to cats. Ruth has more than 15 years of experience in the veterinary industry as a companion animal veterinarian in private practice. Along with being a writer and media personality, she is also a founding member of IDEXX’s Pet Health Network team.